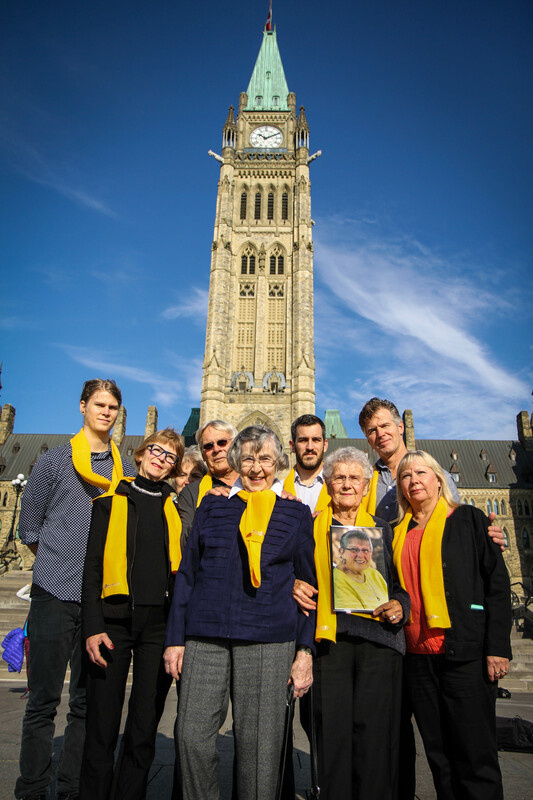 It’s been eight months since our historic victory before the Supreme Court of Canada affirming the right for the seriously and incurably ill to seek physician assistance in dying. At that time, the Supreme Court gave Parliament and the provincial legislatures 12 months to to decide whether legislative changes are needed before the Court’s ruling takes effect. Today, with only four months left until the February 6, 2016 deadline, little progress has been made. In July, after five months of heel dragging, the federal government announced a three member expert panel, two of whom were government witnesses fervently opposed to physician assisted dying during the Carter trial. To make matters worse, the public consultation is a deeply flawed instrument, more likely to spread fear than to elicit useful information from the public. Still, in spite of the process, we are encouraging our members and supporters to make their voices heard in the federal consultation. If nothing else, we must ensure the public record reflects the overwhelming societal support for access to choice at the end of life. The federal government`s online consultation will be open until November 1, 2015. You can participate online in two ways. First, by completing the “Issue Book”- a survey with sections addressing hypothetical situations regarding who should be eligible for physician assisted dying, and what safeguards should exist in the system. Second, by making a formal submission; both individuals and organizations are able to make formal submissions. For more information on taking part in either the federal survey or making a submission, check out this letter writing tool kit. We are committed to ensuring that the voices of the majority of Canadians who support this right are heard. If you make a submission to the federal consultation, please take a moment to email a copy to [email protected] We will retain copies in order to make sure that these submissions become part of the public conversation. In better news, the provincial and territorial governments are stepping in to prepare Canada`s health care systems for the looming February 6, 2016 deadline. As an identified stakeholder, the BC Civil Liberties Association was asked to make a submission to this body. Our full submission is available here. Additionally, the province of Ontario is inviting Ontarians to take part in their online public consultation, which will remain open until October 9, 2015. The survey takes approximately 15 minutes to complete. We encourage all our members and supporters to answer honestly, and to feel welcome to participate even though some of the questions address complex areas in which you may not feel that you have all the information needed. This survey is focused on the voices of patients and families, as such your voice is exactly what is needed. Question #30: Who do you think should have the final say about whether someone has a grievous and irremediable medical condition that creates enduring suffering that is intolerable and therefore can participate in physician assisted dying? Select one only. Physician-assisted dying should be a private matter between physician and patient or family, as is the case for all other end-of-life treatment decisions. As with other decisions, the decision should with the patient on the advice of their physician according to the norms of informed consent law. If a physician disagrees that the patient qualifies there must be a timely right to appeal to an independent body aimed solely at determining whether the patient qualifies for the treatment. Question #31: If you could choose, which conditions do you think would make a person eligible for physician assisted dying if they expressed consent for this option? Select all that apply. According to the Supreme Court’s decision in Carter v. Canada, a person with any of the above conditions would be eligible for physician assisted dying. Question #35: 1a) This question asks you to rate how much you agree or disagree with a series of statements regarding assisted dying. a) A patient should have to undergo a psychological assessment if he or she requests physician-assisted dying. Mandatory psychological assessments are not required in any jurisdictions that currently allow physician assisted dying. Canadian doctors deal with patients’ life-and-death decisions daily (“I want to stop chemotherapy,” “I would like a DNR order,” and “I want to be removed from life support,” for example). Physicians routinely consider whether psychological assessments are required to establish consent in these cases. Such assessments will continue when PAD is legal, but should not be mandatory in every case. Question #35: 1.b) There should be a waiting or cooling off period between when a patient requests physician assisted dying and when it is performed. The process of asking for assistance to die will take time. We do not believe a further unnecessary wait should be imposed on eligible people who are suffering severely and have given informed consent in seeking physician assistance in dying. The province of Quebec has taken this approach, and we agree that it should be followed across the country. Question #35a: If you strongly or somewhat agree to a cooling off period in the above question, you will also be asked the following: In your opinion, approximately how long should the waiting period be? It might be helpful to note that in other jurisdictions where physician assisted dying is allowed, waiting periods vary from none (for Quebec, the Netherlands and terminally ill patients in Belgium) to 15 days (in Oregon and Washington) to one month (for non-terminally ill patients in Belgium). Our friends at Dying with Dignity Canada have outlined additional questions for consideration here. While the online public consultation remains open, other parts of the federal consultation (including in person consultation with key stakeholder groups like the BCCLA) have been put on hold during the election. While all parties are bound by the Supreme Court’s ruling to respect the constitutional right of seriously and incurably ill competent adults to seek physician assistance in dying, the details of the scope of eligibility, the safeguards and barriers, and a number of other important details remain to be sorted out. How the federal government chooses to deal with these questions after Canada’s 42nd election will have important consequences for what this right looks like in reality. Dying with Dignity Canada asked all of the major parties to provide them with a statement on their plans to respond to the Supreme Court’s ruling. Three out of four of the major parties submitted responses. As political parties continue to jockey at the federal level, we were reminded again this week why delaying the implementation of the Supreme Court’s ruling is simply not an option. Donna celebrated the Supreme Court victory, but she could not wait the 12 months until the ruling came into effect. Today we share the words that Donna first shared with the world so that her request may be heard as far and wide as possible. We are close to voting for our next Prime Minister, and nothing regarding PAD [physician assisted dying] is being discussed. I understand it’s a difficult topic for some, and they want to do it right. BUT IT STILL HAS TO BE DONE. The Supreme Court set the deadline, and I hope and pray that it’s kept. On February 7, 2016 people like me can have access to our right to physician assistance to die. But without legislation and guidelines, no one will help us. Please help me and those like me end our suffering by being as vocal as you can, demanding better from our politicians. Please don’t make it harder for us. With each passing day Canadians who desperately want this change in the law are running out of time. We encourage all our supporters to raise their voices in the consultation, and with their candidates across the country, to ensure that on February 7, 2016, seriously and incurably ill competent adults will have choice, compassion, and autonomy at the end of their lives. Delay is simply not an option.